Courtesy of Golden Gate Sotheby’s International Realty, The Dreyfus Group. Just south of Morgan Hill, a few miles from Watsonville Road and on the Santa Clara Wine Trail, is the turn off to Redwood Retreat Road and the way to Bates Ranch Vineyard. This was once a historic stagecoach trail leading to the tranquility of the country, and a haven for poets and writers. The feeling of leisure begins when you have left the broad striped highway for a more humble road as written in A Cabin in the Hills by Allan R. Bosworth many years ago. Today, that haven still exists in the bucolic 932 acre Bates Ranch, which has been in the same family since the late 1950s. 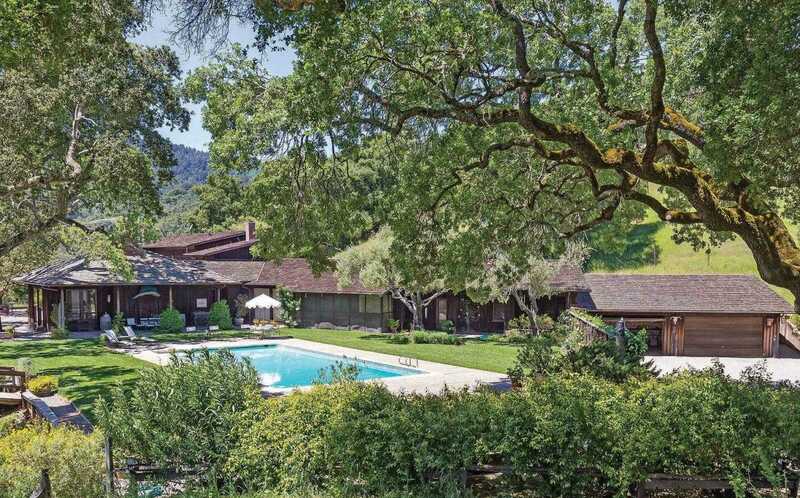 A beautifully preserved William Wurster designed main house watches over the park setting, surrounded by heritage oaks and serene gardens that greet you as you pull up the classic gravel drive. A number of settings await your new dream home. These private lands and vineyards await the next steward who values the opportunity to enjoy a week-end retreat, a summer place or full-time ranch.